Looking for a quality, well designed diamond? Then why not check out Diamonds Factory. For affordable, high-quality diamond jewellery there isn’t many better who can offer the global trust and personalisation that Diamonds Factory have. This global brand sell into over 70 countries around the world, with particular strongholds in London, Paris and New York. There diamonds can be found with Engagement Rings, Diamond Rings, Earrings, Pendants, Bracelets and much, much more. What type of products do Diamonds Factory sell? Interestingly Diamonds Factory don’t have a dedicated sale page. They do strive to offer great value and affordable, all round prices, so it is worth considering prices will be lower and more competitive than other retailers who inflate prices. We will do our best to source the latest and biggest voucher codes to save you money on your order. 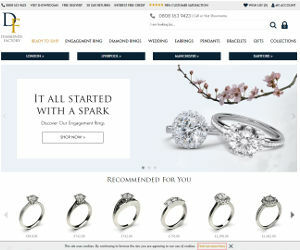 Which popular brands do Diamonds Factory sell?